Brandon Guyer is currently baseball’s Hit-by-Pitch King. You could take that to mean this year, as Guyer leads all batters with 23 hit by pitches this season. Or you could take it to mean lately, as Guyer leads all batters over the last two years with 47 hit by pitches, and his 58 over the last three leaves him just one behind Anthony Rizzo’s league-leading total, despite Guyer having half the plate appearances over that stretch. Or, you could even take it to mean all-time, because if you set a career plate appearance minimum of 500 and search the entire history of modern baseball dating back to 1921, no one’s been hit more frequently than our recently anointed Hit-by-Pitch King. The gap is remarkable. Throughout the entire history of modern baseball, at this particular skill, Brandon Guyer is truly a one-of-a-kind. And make no mistakes, it is a skill. Maybe “skill” isn’t the word you’d immediately think to use, but another way to think about a skill is the ability to repeatedly do something others can’t as a means to gain an advantage over the opponent. Most often, we see that manifested in a batter consistently getting hits, or stealing bases, or drawing walks. Oh, Guyer can hit, too, but where he really gains his edge is the being hit. Eno Sarris wrote about this a bit when the Indians acquired Guyer at the deadline for low-level prospects Nathan Lukes and Jhonleider Salinas. The reason the Indians went out and got Guyer is because he can play all three outfield positions with what appears to be above-average ability, and mostly because he’s been one of baseball’s very best bats against left-handed pitching since he began receiving regular playing time in 2014. 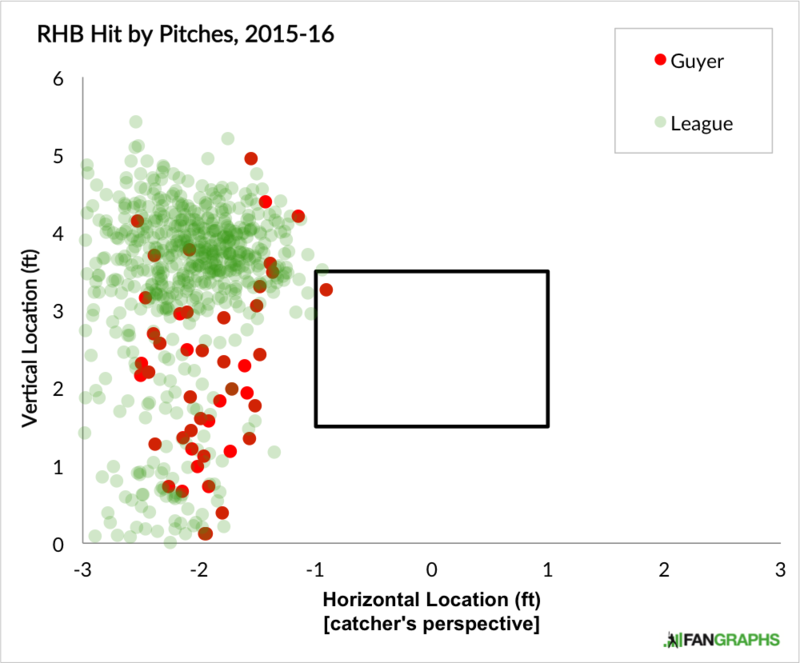 As Eno put it, Guyer improves the Indians’ ability to both hit lefties, and be hit by lefties. But plenty of batters have been able to hit lefties. Nobody in the history of the sport’s been hit like Guyer, so that’s where our focus turns. Aside from the bases being loaded, that’s as normal as an HBP gets. In the typical hitter stance, the front elbow is closer to both (a) the plate, and (b) the pitcher than any other part of the hitter’s human body. All it takes is a pitch to sail up-and-in, where the presence of the elbow provides less room for error than any other part of the zone, and you wind up with an HBP. This is how batters get hit. This is not how Brandon Guyer gets hit. I mean, yeah, he gets plunked in the elbow time and again, too. But this is the Hit-by-Pitch King we’re talking about here. You should’ve known to expect something out of the ordinary. Just as Guyer sticks out on the all-time HBP% leaderboard, Guyer sticks out here. You see the darkest cluster of green — that’s mostly the elbow. Garcia’s HBP lies somewhere in the middle of that. Then you see all the red below the cluster of green — that’s where Guyer gains his edge. Guyer takes it on the thighs, and the shins, and the feet. Not only is Guyer one-of-a-king in the frequency of his hit by pitches, he’s even unique in the way he takes them. It’s silly. 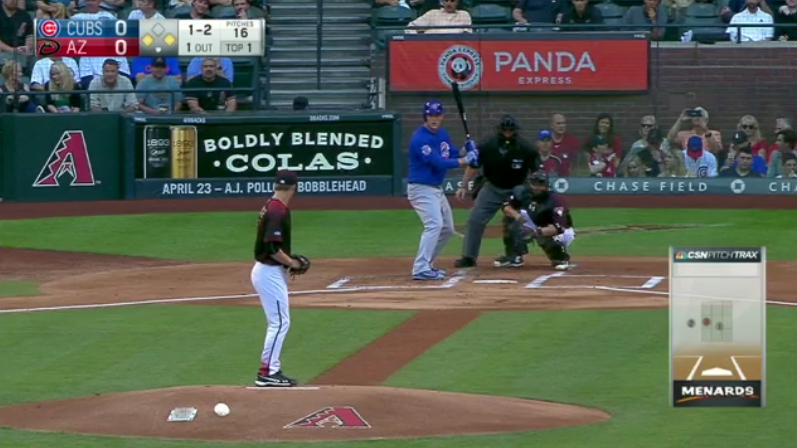 He crowds the plate, for sure, but not even to the extent that someone like Rizzo crowds the plate. He’s close, but not overly so. Where things really get out of control is the stride. After watching enough video of it, I’m convinced that one of these days, Guyer’s gonna goof up and just step right onto home plate. Would that be a strike? 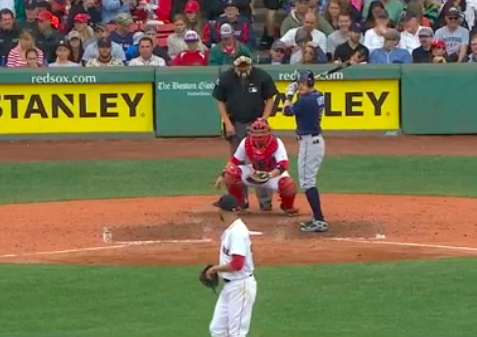 Speaking of video, let’s get to some, and let’s even stick with David Price, because he and Guyer had themselves a little tango back in April that encapsulates the madness of Brandon Guyer rather succinctly. It’s classic Guyer. The stride literally brings his front foot down onto the freshly-painted white chalk of the batter’s box. Realizing his fate, he flexes the quad to prepare himself for absorbing the contact. The lean into the pitch is ever-so-subtle. There’s no hesitation. The bat gets flipped and the gloves start coming off. Guyer acts like he’s been there before, because he has, nearly five dozen times. Guyer moves the leadoff man, Logan Forsythe, over to second. Forsythe later scores on a two-out Steve Pearce single. This one stings, but where I want you to focus is Price. Price, understandably, is visibly upset. Why’s he upset? Well, he’s now hit Guyer twice in two at-bats, and I’d assume he entered the game with an understanding of Guyer’s tendencies. Price feels cheated. Same pitch. 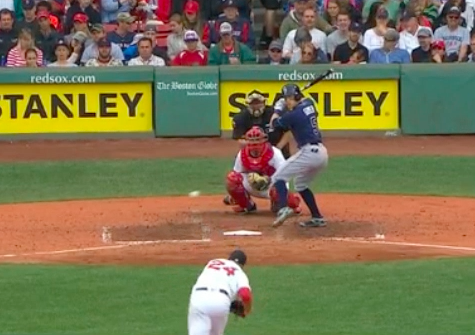 Same pitch that earns Guyer points of on-base percentage and helps lead the Rays to a six-run inning on April 21 earns Price a strikeout against Tyler Flowers in his very next start. You understand why Price was frustrated. You understand how valuable Guyer’s combination of front-foot stride and position in the batter’s box can be. We hoped you liked reading A Further Look at Baseball’s Hit-by-Pitch King by August Fagerstrom! If he gets his foot all the way out of the box during his stride he’s out. I think that’s only the case if his bat makes contact with the ball while outside the batter’s box.